LANSING — Most of the state senators who voted in lame duck for new tax incentives aimed at luring economic development projects had received campaign cash from the main groups pushing for the incentives or their employees. That includes bill sponsors and legislative leaders who received contributions in the six months leading up the Senate votes on Nov. 29. 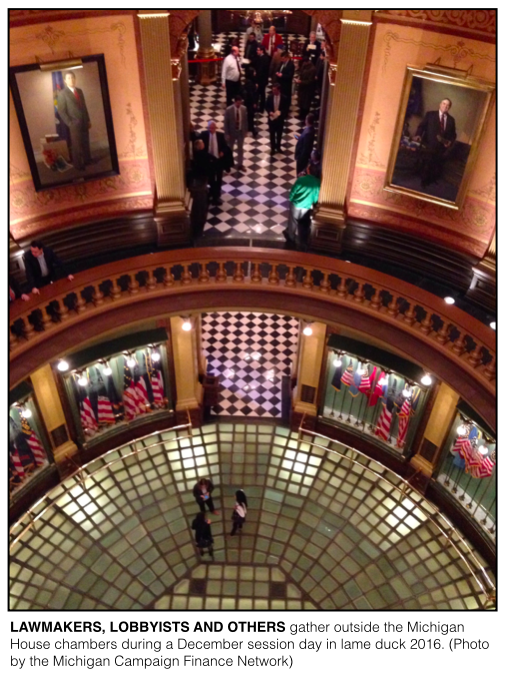 The bills went on to stall in the Michigan House but they could be re-introduced in 2017. Since the start of 2009, employees and political action committees (PACs) of the Business Leaders for Michigan and of Quicken Loans have combined to shell out about $2 million in state-level contributions and independent spending aimed at boosting specific state candidates. The wide majority of that spending has been done by the Business Leaders for Michigan, which describes itself as a roundtable of business executives. In the last weeks of the 2015-2016 legislative session, the Business Leaders for Michigan championed a series of bills that would have allowed businesses adding large numbers of jobs through agreements with the state to keep portions of the new employees’ income tax withholdings. Through a PAC and a Super PAC, the Business Leaders for Michigan has spent about $1.7 million on campaign contributions and independent expenditures benefitting specific state candidates since the start of 2009. Of that $1.7 million, $553,747 has directly benefited the state senators who voted on the incentive bills in November (a breakdown of those contributions is available here). According to campaign finance records, 24 of the 38 current state senators have directly benefited from Business Leaders for Michigan campaign spending since the start of 2009. Those who voted yes on all three bills in the package averaged $18,008 in support from the group. Those who didn’t averaged only $3,875 in support. 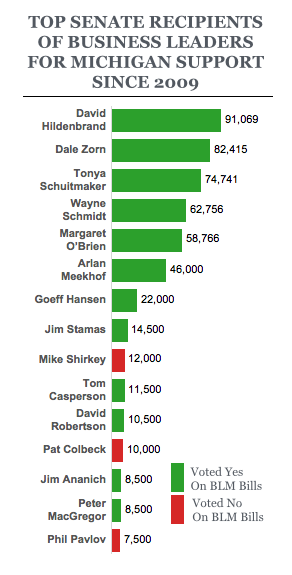 The Business Leaders for Michigan has spent about $62,756 in support of Sen. Wayne Schmidt (R-Traverse City), who sponsored one of the incentive bills, $46,000 in support of Senate Majority Leader Arlan Meekhof (R-West Olive) and $14,500 in support of Sen. Jim Stamas (R-Midland), the lead sponsor of the incentive package. In the last six months alone, the Business Leaders for Michigan PAC gave $20,000 to one of Meekhof’s leadership PACs, and $5,000 to the leadership PAC of Sen. Ken Horn (R-Frankenmuth), the chair of the Senate Economic Development and International Investment Committee, which considered the bills and eventually voted to send them to the full Senate. Kelly Chesney, spokesperson for the Business Leaders for Michigan, said the group supports candidates that align with its “Building a New Michigan” plan, a strategy, she said, is focused on turning the state around with the goal of making Michigan a top ten state for jobs, personal incomes and a healthy economy. Supporters of the Business Leaders for Michigan bills say surrounding states offer more incentives than Michigan does and the bills would help Michigan better compete. Dan Gilbert, founder and chairman of the mortgage lender Quicken Loans, was also looking to reward job creation and economic development during lame duck. Gilbert, Quicken Loans and Gilbert’s umbrella company, Rock Ventures, championed bills that would have allowed for tax credits to boost “transformational” development projects aimed at contaminated brownfield sites. The bills would have helped Gilbert’s efforts to further revitalize the city of Detroit. Quicken Loans’ state PAC, Quicken Loans employees and Rock Ventures employees have made about $335,000 in contributions to state level candidates and campaigns since the start of 2009, according to campaign finance disclosures. About $53,420 has gone to current state senators and their caucuses. In the last two years, the Quicken Loans PAC hasn’t made any contributions at the state level but company executives and other employees have. They’ve made about $70,780 in contributions in 2015-2016. About half of that amount — $35,300 — came in September 2016, the same month the five brownfield bills were introduced. The largest contribution of the two-year cycle was from David Carroll, a Quicken Loans executive who retired late this year. He gave $15,000 to the Senate Republican Campaign Committee on July 14. Carroll was a registered lobbyist in Michigan for Quicken Loans until July 31, according to state records. Carroll also gave $2,500 to Senate Minority Leader Jim Ananich’s leadership PAC on Sept. 22. Earlier in the year, he gave $2,000 to committees tied to Horn, who led the charge for the bills in the Senate. Horn is chair of the Senate Economic Development and International Investment Committee, which voted to send the five brownfield bills to the full Senate. Horn's office didn't respond to a request for comment. In an email, Carroll noted that he made several campaign contributions over the summer. “I have followed politics closely my entire adult life, and over the last several years I’ve consistently (and increasingly) contributed to political campaigns, parties and causes which share my values,” he wrote. Carroll said he didn’t make the contributions as a representative of Quicken Loans and he said he didn’t advocate for the brownfield bills. Jared Fleisher, senior counsel for Rock Ventures, gave $500 to Sen. Wayne Schmidt’s (R-Traverse City) campaign in June 2016. Schmidt is vice chair of the Senate Economic Development and International Investment Committee. According to committee minutes, Fleisher testified before the committee in support of the bills during a meeting on Sept. 8.